The idea for Undercover Reunion was born on my girlfriend’s back porch in Connecticut a year before our 30th high school reunion. We were talking about our childhood days when we would play spies and plot against two other classmates, boys of course, and I came up with the idea that we would go to our reunion and find out that U.N.C.L.E. was real and we would be recruited by the organization to bring down another classmate who was now the head of an international criminal organization.Just like the main characters in the book, she and I were huge fans of The Man From U.N.C.L.E. when we were in the 6th grade. We grew up in a small town, not in Minnesota but upstate New York and there were two boys who were the inspiration for Charles and Eric, who were constantly harassing us in school. My house had a basement where we had a hidden room and many of the references in the novel; the small town bakery, her having two sons and my moving to California, among other facts were all incorporated into the plot of the story. Ayn Rand and Victor Hugo. They both wrote incredible fiction which has lived on way past their own mortality. There isn’t a single author in today’s mindless cotton-candy vampire/zombie world that can write even one sentence, let alone an entire novel, that had and continues to have the impact on people’s hearts and minds as these two writers! Atlas Shrugged. Not because of the political implications, but because Rand was a phenomenal writer. Les Miserables. If you don’t get it, I can’t explain it. If you do, I don’t have to. The Crazy Ladies and The Return of The Crazy Ladies by Joyce Elbert. Read them if you can find them and you’ll understand why. 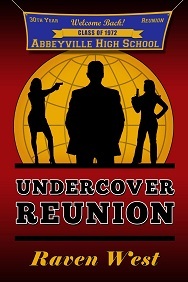 First Class Male, Red Wine for Breakfast and Undercover Reunion by Raven West. Of COURSE my own novels are my very favorites!! When a reader tells me how much they “hated” or “loved” one the fictional characters in my novel! It is a thrill that I was able to created an imaginary character who is so real that the reader is emotionally drawn to them! Absolutely! No matter how long ago, you ALWAYS remember your first! I was in the first grade when I wrote my a short story about a kid who was sick in bed and all she wanted was a red sled. It was pretty bad, but the teacher read it to the entire class, who really liked it. From that moment, I was hooked on writing. I’m currently working on the sequel to Red Wine for Breakfast called Bourbon for Brunch. It’s a political thriller. And a religious reincarnation romantic mystery; Vashti’s Daughter. If you could give one piece of advice to writers trying to get published, what would that advice be?